Daniel's Aunt Joy made this tasty crunchy little snack at a party around Christmas time. I decided to give it a try, and they are so good and healthy! 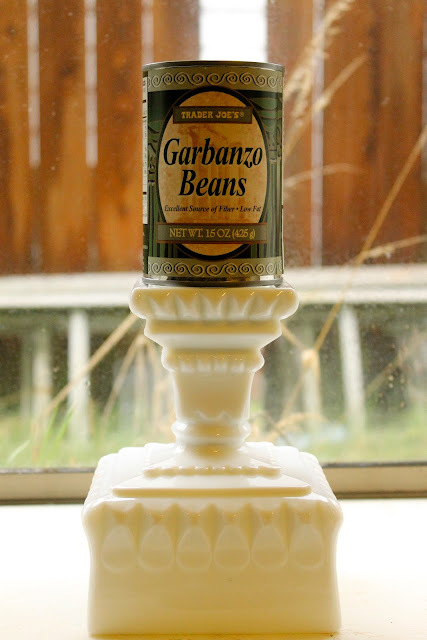 Simply rinse and pat dry with a towel or paper towel one 15-ounce can of garbanzo beans. Spray a pan with olive oil and spread out the garbanzo beans, moving them around to get coated by the oil. Then sprinkle on a little bit of salt, and seasoning to taste. I added a pinch of cayenne pepper and cumin. Bake at 425 degrees F for 35-45 minutes until crunchy. Stir periodically throughout the baking time. I suppose you could do this with any kind of bean. I'll have to experiment. I just made these and my kids ate them up before I could even get them off the baking sheet! I have never had them voluntarily eat up plain beans so quickly before! Thanks for sharing this recipe!